Back in October I reviewed Steven Scott’s book The Greatest Words Ever Spoken. Now I’ve been given a copy of his newest book The Greatest Man Who Ever Lived. I really like this guy’s writings. He has made millions of dollars but yet you can tell he still places Jesus number 1 in his life. 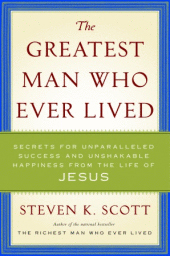 In this book he reveals some of the principles that he has learned from Jesus that lead to success and happiness. Now to be honest many times these books can lean towards the health, wealth and prosperity mindset but I feel Steven does a good job of keeping a balance between the “abudant life” Jesus desires for us and the life of sacrifice He calls us to as well. New meanings to raise your life to new heights. How to develop a mission for your life that will produce greater creativity and productivity. How to communicate with others in a moving way. How to act in a Christ-like manner. How to adopt methods that will take you from ordinary to extraordinary. How to discover your incredible worth to God and others. How to give and receive love in it’s truest form. Steven’s writings and illustrations are very clear and easy to understand. I especially recommend this book to those of you who own your own business or are looking to achieve big dreams.